It’s not every week that Motherwell can bring on a Scotland international as a substitute when chasing an opening goal against stuffy opposition, writes Craig Goldthorp. 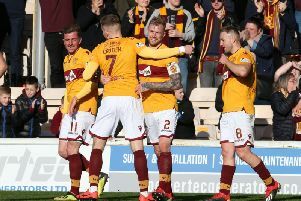 But that’s exactly what happened after 63 minutes on Saturday, when midfield ace Chris Cadden came on to inspire a late goal blitz against St Johnstone which saw the Steelmen net three late goals by Elliott Frear, David Turnbull and Richard Tait to clinch a comfortable 3-0 win. Cadden (22), whose last first team club game was a 7-1 humbling by Rangers at Ibrox on November 11, said: “I’ve had to wait on getting that game against Rangers out the system. It was really hard. “The injury happened only 20 minutes into the game. It was 1-1 at the time. “When you are 7-1 down you can’t come off with a sore knee because people will think you are at it. “I just played on for the full game. Looking back, I should have probably come off sooner because I felt the pain when it happened. “But I decided to play on, which in hindsight was maybe silly. “I don’t know if that did more damage or not, but I don’t think it helped. “So it’s been a long time coming, but it was brilliant to get on against St Johnstone. I didn’t want the game to end! “It’s been my main motivation to get on the park. I’ve worked hard in the last four months, and it was a good feeling going on. “Was I surprised when the manager asked me to go on? Maybe. On Friday he pulled me and asked me how I was feeling. I was like, ‘I’m good, I’m really good’. I came in on Saturday and found I was on the bench. “I quickly texted my mum and dad to tell them. Then I just wanted a minute on the park and it felt good. Cadden’s absence has helped the emergence of Jake Hastie, Turnbull and Allan Campbell as first team stars. 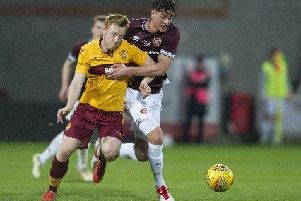 Cadden, who like Hastie is out of contract at Motherwell this summer, added: “The young boys have been a real catalyst for me as I’ve watched from the stands. They have been brilliant. “At 22 I feel old out there now with all the young boys coming through, but it’s great to see. “Davie was in when I was playing, but Jake was still on loan at Alloa. I know how hard they work. “I told Jake his chance would come and to be ready. He’s been brilliant and he has taken that chance. Watching on I’m like a proud dad! It’s great for Jake and all the young boys. “There’s been no prouder man than me to watch them all come through. I did that myself a couple of years ago. “I’m here for them if they want any help or advice. “I don’t know how I’m saying that though at 22! You see the fans love a young boy coming through. I know from personal experience. “But with the team doing so well I’d go home and think, ‘I can’t just blend in’. I knew I needed to come in to training and games and try to stand out, and that’s what I’ve tried to do. “I’ve really pushed myself and worked hard over the spell I’ve been out. Hopefully the hard work pays off. “There were no second thoughts going in for challenges. My knee is fine, touch wood.